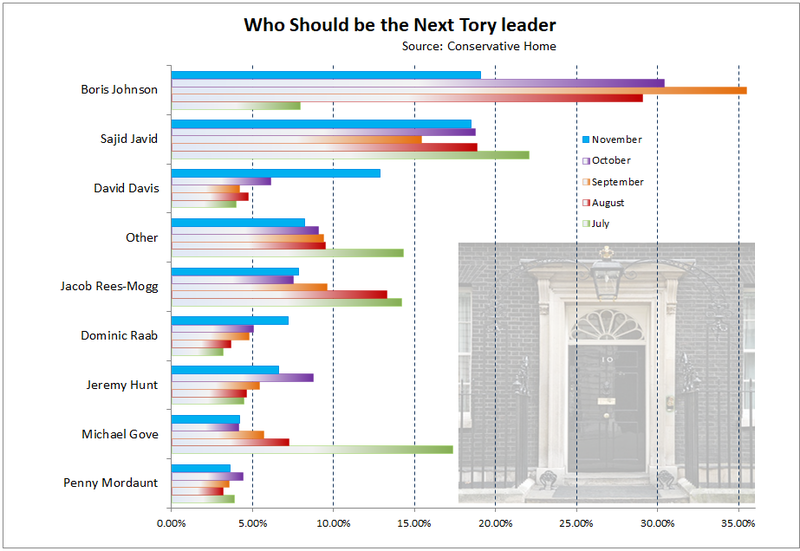 Conservative Home yesterday published their monthly survey on the next Tory leader and the results are, as ever, interesting and informative. The striking change over last month is that Boris Johnson’s lead has fallen by 10 percentage points, placing him neck and neck with Sajid Javid, on 19.08 per cent and 18.5 per cent respectively. Javid, however, hasn’t been building support and his result for November is slightly weaker than in all the previous surveys since July bar one. 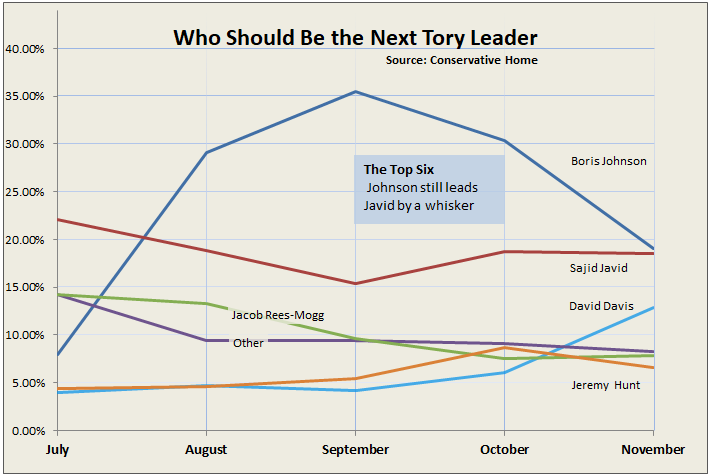 Johnson’s support has leached to David Davis who previously ranked around seventh and now finds himself in third position thanks, possibly, to his being perceived as a suitable caretaker prime minister when May resigns or is deposed. ConHome respondents have broadened the field of ‘possibles’ beyond the 14 names (including ‘other’) who featured in earlier surveys, but our graphic winnows out the bottom order in the interests of avoiding clutter. New names on the list of 14 below Penny Mordaunt (who scored 3.64 per cent) are James Cleverly, Tom Tugendhat and Amber Rudd. These newcomers replace the previous also-rans, and the present survey sees Philip Hammond, David Lidington and Gavin Williamson crashing out of the list altogether after vying with one another over the previous four surveys for slots 12 to 14. The graphic above makes the message fairly clear: should May be removed before the Brexit process is concluded, then there simply will not be enough time for the wider membership to be involved in electing a replacement before Brexit day in March 2019. 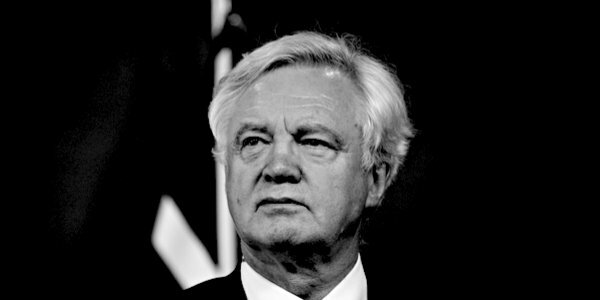 Under such circumstances there would likely be support for Davis to get Brexit done properly and out of the way. Were a leadership contest to be decided by the party’s grass roots, it seems clear as things stand that the two names to go forward to the membership should be those of Johnson and Javid. 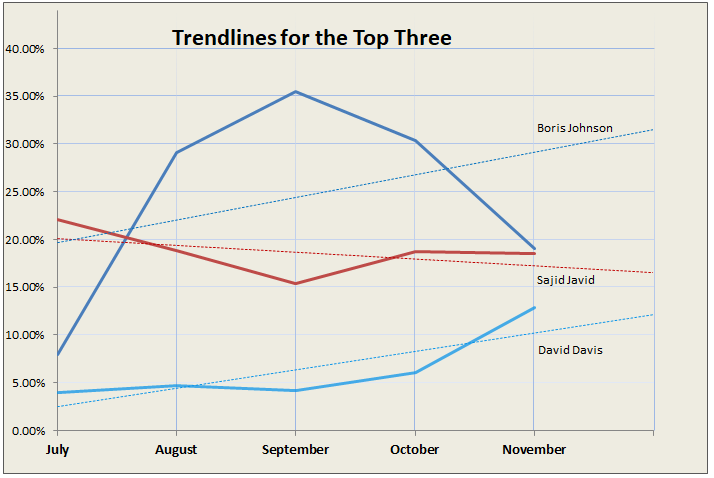 Unsurprisingly Davis looks to be on an upward trend but the situation for the other two is worth thinking about too. Johnson’s performance has considerable volatility but as things stand the outlook for him is positive. For Javid the prognosis is more stable but suggests that he may need to widen his reach and appeal. However that may be, the present front runners are so far ahead of the pack that it would need a major upset for a new name to emerge ahead of them.